Soul Eater Not confuses me from a marketing perspective, but it is a pretty good anime for for the slice of life yuri lovers. I think that because they pinned on the Soul Eater name, people rightfully come in expecting an action/drama series with dynamic and cool characters. Instead, what you get is a super cutesy, light-hearted, yuri slice of life series that just happens to take place in the world of Soul Eater. I definitely think this story probably would have sold better if they made an original setting, but I think I personally like it better this way. You can see the creator's love of Soul Eater, and the girls provide a good vantage point for how the typical person experiences the Soul Eater universe. I think it is cool how we got to see a different side of the world and characters depicted in Soul Eater placed in a more docile, less high-stakes setting, all while watching cute girls do cute things. While Soul Eater Not doesn't share a lot of the themes and mood of Soul Eater, and certainly isn't of the same quality, Soul Eater Not helped me picture myself in the Soul Eater Universe, and I hope it can do the same for you. I watched this show in spite of my best friend's warning not to bother. I loved the original Soul Eater, I liked how smart it was, how it didn't really underestimate the audience, I liked the darkness it had... I liked it all. I knew this show, on the other hand, was set in the same universe, but the genre was more moe than anything. I can roll with moe if I'm in the mood... But this show is awkward. It has occasional very interesting and dark moments, but those were soon overrun with dumb humor. Ok, I guess its switching to moe, but its not good moe. Its poorly animated, awkward angles, unrealistic based on what just happened on the previous episode... and in the end it just ended up being unrelatable. This show is mediocre at best, and a far cry from the original Soul Eater. Over all, meh. Powered through it in 2 days because I'm a completionist, and it was just meh with occasional entertaining moments. if you like you girls doing silly cute girl things you'll love this but if your like me and was looking for a little more insight on the soul eater world, well, this aint for you.this is all i really have to say but crunchy rolls review system is making me type more but honestly i think i've summarized this show pretty well. but regardless of my review or anyone's i encourage you to at least watch 3 episodes and decide for yourself. Relatively decent.. Barely call it a Soul Eater Spin off. As someone who has watched the original Soul Eater many many times (in my top ten favorites), I was expecting a lot but not at the same time. 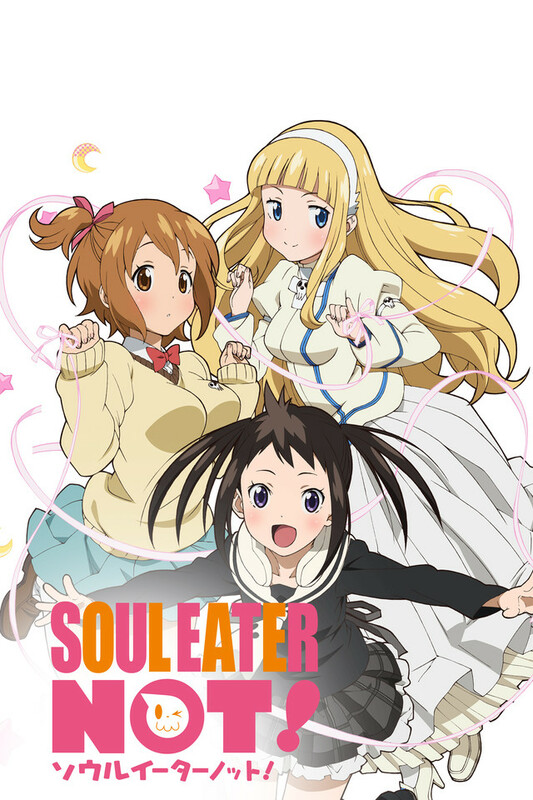 Soul Eater NOT's name is incredibly appropriate as it is definitely not like the original. There are a lot of inconsistencies with the original and even if their was to be placed a year before the original the inconsistencies still add up... The plot was decent though but the way they went about the plot is what killed it. The reason I gave it 3 stars instead of 2 was because the bit of background of some of the original characters. I do think that if someone had not seen the original Soul Eater at all I think they might have enjoyed it more. Looking at SEN based on it just as it is, not as a spin off, I still have issues with it. Especially with how it ends... SPOILER ALERT. Witches are supposed to be difficult enemies.. yet one hit? really? And it goes back to the power of friendship with two meisters..... I dont think it would be very functional to have one weapon to share.. Obviously they aren't fighting major enemies yet as they are in NOT but still... It seems as though the last five episodes were just thrown together and rushed. Honestly I don't recommend. Good Addition to the Franchise. This wasn't meant to be another series like the first Soul Eater it has events before that series like how Sid died and that death city is in America (death valley cal?) and answers a few other questions. This is mostly about the 3 girls seen in the picture getting used to life at the school and with each other most of the characters from the original show up some more than others their is some action mostly in the last few episodes and it was done really well I thoroughly enjoyed this anime and like my headline says is a pretty good addition to the series just don't expect it to be like the first series I didn't and I think it stands up really well on its own. Their is a little bit of teaser fan service and I give a 5 on here and a 8.5 on a 1 to 10 scale. I definitely recommend it. Really liked the English dub also. Unlike some reviewers who can't be bothered to read the title, don't get into this thinking its some soul eater spiritual successor, because its not, you'll just be disappointed, its a more of a slice of life spin-off. If you're familiar with the genre, and enjoy it then you're in for a good time as this is just your average light-hearted story, with good visuals and decent music. If you miss the aesthetic of the original then watch this for a new story, in nostalgic environment.